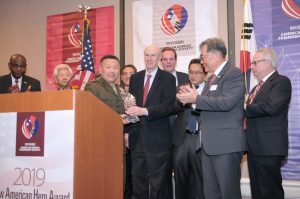 Sandy Springs, Jan 25, 2019 — The Korean American Friendship Society host its annual New American Hero Awards Gala at the Westin Perimeter North Atlanta Hotel. Over 200 guests including community, business, and legislative leaders attended the gala. The Society presented a Lifetime Achievement Award to Jay K. Eun, a long time AKFS Board member of AKFS and an active leader in the Korean American community for his dedication and selfless service to the community over the years. The 2019 New American Hero Award was presented to Major General Daniel D. Yoo, U.S. Marine Corps Forces Special Operations Command (MARSOC) for his service and contribution to the Marine Corps and the country. The award came along with a $10,000 cash prize which Major General Yoo donated to Semper Fi Fund, a foundation dedicated to Marine Corp veterans. Accepting the donation on behalf of Semper Fi Fund is Laura Castellvi, Community Outreach of Semper Fi. “I am proud to witness the impact of the Awards has made over the years. 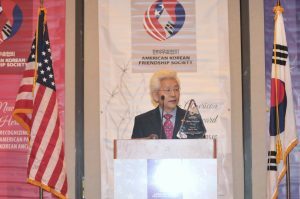 It recognize the sacrifices and contributions made by these hardworking individuals who never seek the limelight and continue their excellences daily,” said Frank Blake, Chairman of American Korean Friendship Society, Delta Airlines, and Grady Memorial Hospital. Ambassador Thomas Hubbard who has served as former Ambassador to South Korea from 2001-2004 delivers the keynote address for the evening. Ambassador Hubbard, who is also the Chairman of The Korea Society, shared his insights on the recent US-North Korea Summit in Singapore and latest development in Korean affairs. “The New American Hero Award has set a new standard in recognizing the sacrifices and contribution made by Korean American to this great country of USA. I am proud to be part of the program as it brings me joy to witness these heroes who dedicated their life in service to the community and our great country,” said Sunny K. Park, President of the Korean American Friendship Society.